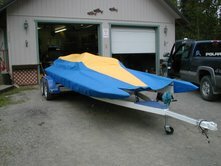 A Boat Cover in Front of Our Shop. Blu Skye Designs is a small industrial sewing shop located in Wasilla, Alaska. Specializing in custom design and fabrication. All work is made to the exact specifications set out by the customer. All products are designed and sewn to withstand the harsher climate and heavy use Alaskans tend to give boats and other gear. Custom requests and innovative ideas are always welcome. (c) Copyright 2006 - 2007 Blu Skye Designs.